For my first card today - I'm featuring a fun ink technique, called Watercolor Bokeh! I hope you remembered to move your clocks ahead this weekend! It's that time again and yes, that means 'Spring is Here'! 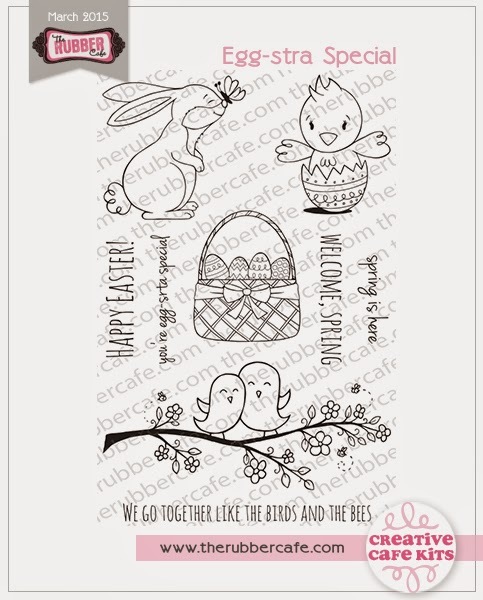 This is perfect because this month's kit over here at The Rubber Cafe' is called Spring is Here- and it's a wonderful kit full of spring papers and stamps for Easter and other occasions - so if you haven't already subscribed, there's still time to get in on all the fun just go here! I'm only using the papers and stamp sentiments this time- as it seems simple graphics seemed the best. This is a 4 1/4 x 5 1/2 " card so my card base was cut at 4 1 /4" x 11 and scored at 5 1/2". For my layers, I have a Pink Cardstock at 5 1/4" x 4 1/8"
and a Green patterned paper from the pad cut at 5 1/8" x 4"
For the Bokeh ink technique- I decided to used water color paper - I've seen this technique used with all type of inks, so you should checkout all the varieties out there and find what works best for you. I really wanted the water color look, as it reminds me of Easter dye when coloring eggs! I'm sorry my camera battery died before I could get pictures of this process so I'll describe the best way I can on how I did his technique. I washed the whole surface with water using a fairly large brush. This helps the ink move around on the paper. For my inks I used Rangers' distress inks - Mowed lawn; Broken China and Worn Lipstick. *Tip: The colors will dry much softer and as I found when I first started with more pastel shades - like shabby shutters, pink, and tumbled glass and they were just not vibrant enough so I re-wet my paper and added the colors above. Then I took each ink and applied it directly to my craft mat and spritzed each with water - with a wet a brush I just applied it to my paper- and allowed it to move around as it wanted. I didn't let them blend too much - but made sure I had all 3 colors and that my paper was covered fully with ink. Where there was too much pooling of ink I took a dry towel and blotted it up. You can also spritz again with water if you want to create more movement. Distress ink reacts well to the water so really easy to work with. I let this dry - you can also take your heat gun to your paper to speed up the process. Next for the Bokeh affect - I used my Wedding Dress white ink from Memento-Luxe. 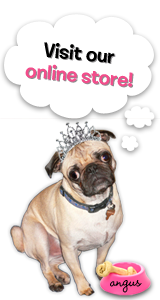 You want a wet pigment ink that will be fairly opaque, a couple of other inks that I have tried and that work just as well are Memories Unicorn Ink and Stampin'UP! White Craft ink. For your circles you can use a purchased template or punch circles in paper to create your own. But I found something even easier and just as effective was my circle sponge applicator from Ranger, w/ a clean sponge; and a clean small finger tip sponge! I started with the larger circles first you want to lay down ink in different intensities. I just used my applicator like a stamp to create the circles. For less intensity I used it again w/o re-inking. I repeated this with my smaller finger tip sponge applicator, randomly spacing my circles and overlapping as well. I left more of my colors showing then I've seen in some, so it all depends on what you're happy with - you can cover it more with less intensity or coverage. You'll know when your done! To finish once the white ink had dried. 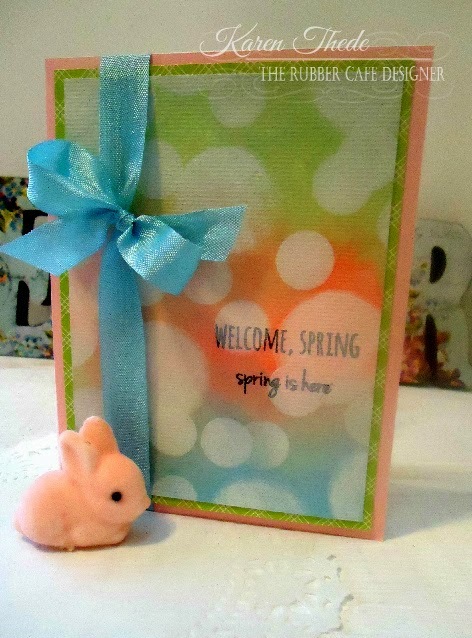 I used the Welcome, Spring and spring is here sentiments from the kits coordinating Stamp set Egg-stra Special. I stamped with Memento ink. I think maybe after seeing my ink looking a bit like it's absorbing into the white, I should have used Archival ink for this step. I think that would have stayed on top better. Tip: I also used my heat gun in this step to make sure it was really dry before stamping my sentiment. I layered and assembled my card - added a blue ribbon from the kit with a simple bow. Here's another look at my finished card. Thanks for stopping by- and I hope you'll give this technique a try - you'll be amazed at the different effects you can achieve just by changing your ink colors and intensity. It's fun, easy and makes an amazing background for any card or project! 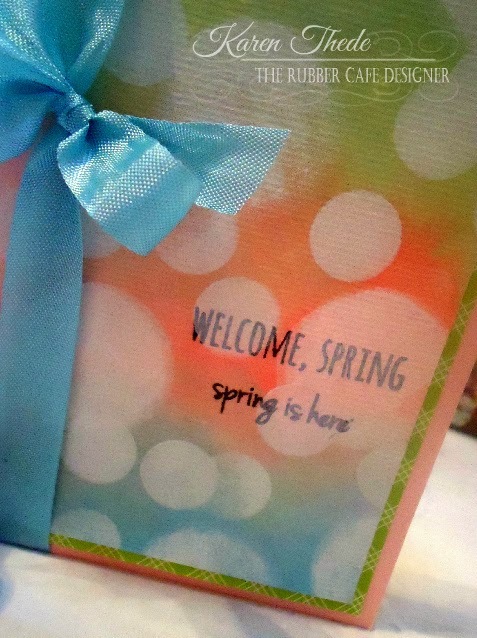 Be sure to keep coming back this month - as the team has some amazing projects to share featuring this Month's Creative Cafe' Kit- Spring is Here! Amazing technique and great detail description. I may have to give this a try! Great job and so beautiful. Love the simplicity of end look. Perfect for Spring.